Before she decided to step inside a wrestling ring, Ronda Rousey was the best pure fighter in MMA today. She was the first female world champion and the first fighting champion to ever hold an Olympic medal. A UFC Hall of Famer, there is no denying the pedigree of Rousey. Since losing to Holly Holm and Amanda Nunes, however, there has been a severe lack of buzz for female fighters. Yes, we have Joanna Jedrzejczyk and Holm, but that doesn’t appear to be enough. Just like when Conor McGregor was gone, some passion for a specific part of the UFC died down a little. Luckily, the UFC might have just hit the jackpot in 2018. Dominant female fighters with colorful personalities are taking over, just in the nick of time. 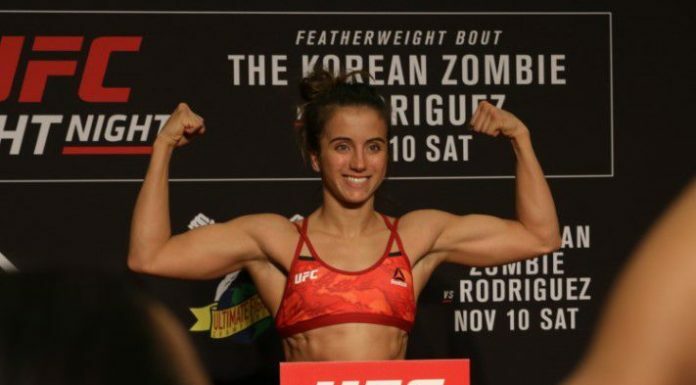 For starters, 20-year old Maycee Barber (6-0) is working her way up the ladder in the MMA world. While she still has a long way to go, her overall ability is something to behold. She is a diverse fighter; she can beat you via submission or KO. In a strawweight division that is looking for challengers for Rose Namajunas, Barber appears to be getting groomed for her time to shine. Barber wants another fighter whom Dana White loves to talk about, Mackenzie Dern. The 25-year old Dern (7-0) is a former medalist in her own right. A true submission specialist, Dern’s build cannot be underestimated. Her one issue is making weight, something that may very well hold her back. If these two were to square off, it wouldn’t be a bout to sleep on. While we have two young fighters, two champions are looking to prove they are truly better than Ronda. Cris Cyborg, who has attempted to fight Rousey before, will be defending her UFC Featherweight Championship against Bantamweight Champion Nunes. Cyborg (20-1, 1 NC) and Nunes (16-4) both have impressive resumes that focus on their boxing ability. Relatively young, if Nunes can beat Cyborg her career as a “champ-champ” may just be the most significant thing for women’s MMA. This is just the UFC we are talking about. Bellator, Glory and all female boxers bring something different into the combat sports fold. There are a lot of names to count, but one must remember what Rousey meant to the sport. There is nobody that can replace her, but that is not what they truly want. The buzz that initially started because of her can continue on with the next generation. We can only hope the UFC takes advantage of this second revolution.